The April to June 2012 Sentinel Literary Quarter is a bridge issue in our exciting and challenging publishing art-venture. What an amazing journey it has been! Our readers must remember that it all began with Sentinel Poetry (Online) our monthly magazine that set forth on its journey in December 2002. I was the founding editor Sentinel Poetry (Online) and drove the truck until Amatoritsero Ede took over as editor. Amatoritsero, author of Hitler’s Children, and founding editor of the Canadian journal Maple Tree Literary Supplement (MTLS) www.mtls.ca brought his own style and energy to the magazine and for the period he edited the magazine, we won over many new readers, and people who loved a different kind of literature from what I was bringing to them. His tenure as editor was truly vibrant and I continue to celebrate his work at Sentinel to this day. I believe that we did some of the best work on Sentinel during that period. After Amatoritsero moved on to drive his own truck, I got back in the driving seat of the Sentinel truck, and during this period we amalgamated the Sentinel Poetry (Online) with our print magazine, Sentinel Poetry Quarterly, giving birth to Sentinel Literary Quarterly. I was regent. I have always seen myself as one who must step aside from the main driving seat and allow other hands drive the Sentinel truck. Tinashe Mushakavanhu stepped into the role and once again the flavour of literary dishes served at Sentinel changed. For one thing, the quarterly publications were leaner and featured less poetry than ever before. Tinashe’s tilt towards topical, sometimes controversial issues gained a new band of readers and we noticed a small increase in our readership and most importantly we retained majority of our readers. Tinashe’s academic demands necessitated his vacating the main editorial seat, but he remains a contributing editor on the board of the magazine. We can’t thank him enough for the work he did as editor at large. This April to June 2012 issue has been edited by me and like I wrote earlier, it is a bridge between the old SLQ and the new starting with the July to September issue. Instead of a single editor at the helm of things, we now have a dedicated Poetry Editor, CHris Stewart (He always writes the first two letters of his first name in CAPS. Some kind of brand thing going on there, I think.) Our new Fiction Editor is Ngozi Chuma-Udeh. Once again we have an editor that lives outside the United Kingdom. Ngozi is the Head of the English Department, Anambra State University, Nigeria. Our Art-Venture is evidence of the power of the Internet. I will work in the role of Drama and Non-Fiction Editor. It is looking good already and we believe that the new era of Sentinel Literary Quarterly will be exciting and muscular. What does the current issue offer you? We have two poems by a young Nigerian writer, Nnamdi Okose. 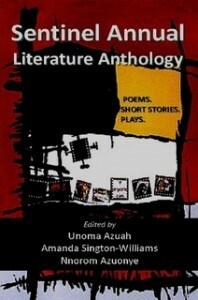 Other poets featured are Patrick Williamson (six poems including ‘Cordoba’), Chris Hardy (four poems including ‘The Tower of Song’), and Dozie Nwanna, the diplomat-poet has four poems including ‘The Pouty Wonder.’. There is the beautiful short story “5000 Flamingos and More” by Bradford Philen that will take you on a scenic journey through safari Africa, and we have much pleasure in offering you the racy ‘The Glass Screen’ by Laura Solomon in which trouble follows an illegal immigrant stripper that leaves scars on her mind . The second work by Laura Solomon in this issue is a short essay, The Writing Life, as the title suggests, on the life of a writer. I welcome Chris and Ngozi to Sentinel Literary Quarterly and really look forward to years of working with them in raising our magazine to new heights. 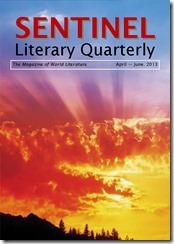 I also warmly welcome you to a new beginning in the journey of Sentinel Literary Quarterly. Read the submissions guidelines, Ijendu. Thank you.